I'm a little slow. Can we all agree on that? Yes? Everyone? Thank you. Way back in 2006, when I still lived in Florida, I attended the Blue Ridge Christian Writer's Conference, somewhere in the gorgeous hills of North Carolina. There was a speaker who stood out, who touched my heart and made me laugh. I took his classes. I sat at his table and struck up conversation. I bought one of his books. And loved it. Love it still. Steven James. A master story teller. No, seriously. He has a masters in story telling. How cool is that? I would LOVE to have a masters in story telling! So a few years ago when he came out with his first thriller, I purposed to buy and read it. I mean, I practically KNOW the guy. Oh alright. I talked to him once and tried to sound clever. Still. I never did read it. 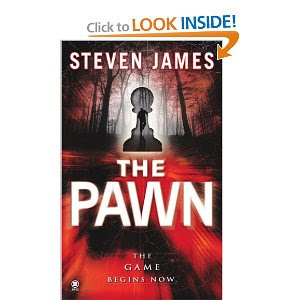 The name of this book, released about three years ago, was The Pawn. So shoot me. I SAID I WAS SLOW. I read it. Last week. Oh. My. Word. Do you like thrillers? Murder mysteries? The first chapter made me put the book back on the shelf. Freaked me OUT. I almost walked out. But I'm glad I went back to the shelf and grabbed it to take home. It's a very good book. The writing's a little sloppy in the beginning (after the first chapter). But it picked up pace and held me to the end. Ended well. And for those of you who won't read Christian fiction, it's not a "Christian" book. Just a really good book. If you'll excuse me, I'm off to find the second book in the series, The Rook. Ta! Sounds good. I'll have to put it on the list. That is my husband's kind of book! A book that draws you back after you walk away is always a winner! It's always nice to get book recommendations from a friend. Good honest info instead of all that marketing crap from the media. Thanks. Somehow laundry and keeping the kids in line get in the way of a lot of good intentions. I'm headed to our local library. "There is no greater thief than a bad book..."
In contrast, it's lovely to find one that intrigues you!